Bonggamom Finds: Moms Light Up Our Lives -- share your story and win a Root Candles Scent Collection! Moms Light Up Our Lives -- share your story and win a Root Candles Scent Collection! Mother's Day is May 9, and there's no better time to give a shout out to the mom in your life! Root Candles knows all about mothers and families -- they've been a family-owned candle company since 1869 and are now in their fifth generation, and to celebrate Mother's Day, they're inviting everyone to share all the ways Moms Light Up Our Lives. For me, Mother's Day couldn't be coming at a better time: my mother is flying in from the Philippines next week, so for the first time in over a decade my mother is actually going to be with me on Mother's Day! My sister and I both have daughters, so we'll have three generations of Bongga Women on Mother's Day, and my mind is swimming with all the ways we can celebrate Mother's Day together. I'm guessing it will involve her favorite burger joint, In-and-Out Burger and I'm hoping it will also involve a shopping spree at some clothes outlet. My mother has always been very frugal with money. We hardly ever ate out at restaurants when we were growing up, and we bought new cars only when our old ones collapsed on the road. All those trinkets that kids whine for their parents to get them? Like candy at the grocery checkout line? Souvenirs at the souvenir shop? Not with my mom! And now that I'm an adult, I'm really grateful to her for training me to live within my means, think carefully about my purchases and resist the temptation to spend, spend, spend. She would always tell us to be thankful for what we had, and that you can never tell how much money a person actually has based on his material possessions because he could be up to his ears in debt, or a millionaire who's careful with his spending. It's a lesson that has stood me in good stead, and one that I'm trying hard to pass on to my own kids, especially now that we live in Silicon Valley surrounded by dot-com millionaires. ...but she also taught me that some things are worth spending for. Even though she's careful with money, my mother doesn't hesitate to spend money on something that matters to her. When she finds a dress or a pair of shoes that flatter her and fit her well, she'll buy one in every color. She encouraged us to aim for the best schools, no matter what the cost, because a good education is always a solid investment. When I got married, she and my dad gave me a strand of Mikimoto pearls because she said they are the best and they will last a lifetime. She happily helps us out with the cost of airfare for our visits to the Philippines, because family is important to her and having her kids and grandkids all together brings her more happiness than a week at a spa. She taught me to be independent. My mother was always a working woman, even when her peers were stay-at-home moms who attended luncheons and scheduled weekly hair salon visits. When my friends were being driven around in chauffeured cars, she taught us how to navigate the wild, crazy world of Metro Manila's public transportation system. When my friends were being given weekly allowances, she gave us a monthly allowance so we'd learn how to budget. She always stressed the importance of a good education and good grades so we could get good jobs and stand on our own two feet. She taught me to be comfortable in my skin. I was the world's biggest slob and the bane of my mother's existence when it came to good grooming. I was self-conscious about my height, so she was always telling me to straighten up, and she was probably the only parent of a teenager who begged her daughter to put on more makeup instead of less! I still don't use makeup, but I've finally taken her underlying message to heart: being comfortable with who I am and taking pride in my appearance. And my mother does get the last laugh: I now struggle daily to get The Pea to comb out the tangles in her hair and straighten her back. If my mom weren't so ladylike, she'd smirk and say, I told you so. For all that you've taught me, mommy, you have my thanks and my love! Happy Mother's Day! Win a Root Candles Scent Collection! The winner gets to choose one of three scents: Sun Dried Cotton, English Lavender, or Ginger Patchouli. 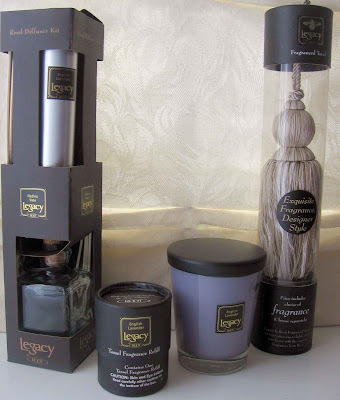 They sent me those three items in the English Lavender scent, and this prize pack is a true luxury! The essential oils make the room smell heavenly, and the candle is made of beeswax and other premium natural waxes, so it's kinder to the environment when you burn it. Leave a comment on this post with your own Tribute to Mom -- share with us how a mom in your life (your own mom, your grandma, your best friend's mom, your wife) has brightened your world in heartfelt, funny, or even unexpected ways! You can also post your story in your own blog and leave a comment here with a link to your post. 1) Become a Root Candles Facebook fan and leave a comment on their page, telling them you've joined the Mother's Day giveaway on Bonggamom Finds. 3) Blog about why you want to win the My Mom Lights Up My Life with links back to this post, as well as to the Root Candles' homepage (link: http://www.rootcandles.com/) and post the link it in the comments below. 6) Click on this link and enter the CafePress American Idol sweepstakes (leave a comment here telling me you've joined). Maximum of 7 entries per person. This giveaway ends at midnight PST on April 26, 2010; I will draw a winner at random on April 27 and post the winner's name after the winner confirms acceptance. For additional giveaway rules, click here. Good luck! Disclosure: I received a Root Candle Scent Collection prize pack and was compensated for my time in hosting this giveaway. The views and opinions expressed here are my own. My mom is funny, bright, compassionate, and inspirational. She volunteers at an inner city soup kitchen, and takes cares of my ill dad. She is very special. Became a Root Candles Facebook fan and left a comment on their page, telling them I joined the Mother's Day giveaway on Bonggamom Finds. I was raised by a single mom. Every single day I ask myself how she did the hardest job in the world alone yet with such grace. I follow on Blogger as Charity Donovan. Ahh, i wrote a comment and Idk where it went?? Grrrrr. I thought my comment would be together with picture. I tried to be your fan on facebook but it says the page is no longer there. I clicked "like" on your facebook group. When I was sick my mom lives with us for 6 months and helped me with the cooking, kids, etc. At the time we lived in a very small house and she slept on a sofa bed in the middle of the living room - big sacrifice! Mom~you are far away from me now but I know that you are still watching over me.As even though I can't see you I know that you are still with me.I miss your smile~your laughter and most of all your hugs..You were not only my Mom but also my best friend.I know that you are free of pain now and that is what keeps me going.I love and miss you so much! Happy Mother's Day in Heaven! I follow you on Networked Blogs too! My mom has always been a role model for me and the rest of my family. She was always there for us when we were little no matter what. She really gave her life for us and I had a great childhood. She just makes my life happy knowing what a great woman she is. Love you mom!!! A recent story about how my mom's sacrificial love: She recently spent 2 whole days at my house, picking up, doing laundry, cleaning my entire kitchen and 3 BATHROOMS including a really really nasty toilet, and then paid for our lunch and dinner out the whole time! She said it was fun and she'd gladly do it again. What a great mom! I entered the Hey Dude giveaway! Congratulations to the winner: #3, cdziuba!